If you are selling your home, chances are you will need to choose an agent to sell it for you. Being in that position myself, I was surprised to discover that there are numerous varieties of Real Estate Agent. I made a study of them and have summarised my findings below. Some features I have noticed, and anecdotal data supports this, to be common to many varieties, while some features are specific to one or two and are indeed the defining characteristics of those particular cultivars. I have made a diagrammatic representation of one variety below. I’d have done a diagrammatic representation of the others but want my dinner, and the dog is looking at me so I know she wants hers too. Male plumage includes shiny suit and wide subtley coloured tie, chunky gold ring, black leather loafers with those ridiculous long toes they have at the moment, and a white binder with laminated pages creating a manual power-point presentation. The Agent flips the graphs and dot point lists while courting with a soliloquy outlining philosophy of selling property, psychological tactics (playing on the “Fear-Of-Loss” factor) and supporting colour-coded statistics, inserting an occasional question to which there can be only one reply thus allowing one to be involved but without having to actually contribute anything. Defining features : inability to diverge from the script, being taller than you, trying to convince you to take him on because he’s qualified and, hey, qualifications are important because ANYBODY can be an agent. YOU could be an agent, he says...presumably intending to shock and so prove his case...Common Agent features: dresses better than you, car is better than yours, phone is better than yours. The Ancient Avuncular agent likes a good chat and must, you tell yourself, be skilled at the game if he’s still in it at his age. His receding hairline and age spots invoke a level of empathy (or sympathy depending on how much younger you aren’t or are). His obvious knowledge of building is reassuring until he begins to describe defects such as the spacing between your joists , something which no man has ever complained about before, and you aren’t ashamed to admit that more than a few have had a good look up under them. You’d always assumed that your joists were the same as everybody else’s. But then again, you realise you haven’t actually seen anybody else’s... He leaves you a quivering wreck after pointing out that numerous features which were passed by council at the time would never be passed by council today (what are you supposed to do...rebuild???). Defining features: Is hard of hearing (not what you want when a prospective buyer tentatively whispers an offer in his ear), is hard of driving (ran over your baby olive tree and then parked on your neighbour’s garden), and hard to imagine selling anything, or if he did, realising it. Common Agent features: dresses better than you, car is better than yours, phone is better than yours. This agent is particularly tricky because there is nothing wrong with him. He is friendly, genuine, has good references, is attentive, has time to chat, has good hearing and driving skills and is not hard sell. His main draw-back may be in suggesting you visit one of his open-for-inspections to see how a house should be presented. You come back from it totally depressed knowing that your house will NEVER sell because it could NEVER look like that. It was so cleared out of regular stuff, had such modern furniture, such futuristic lamps (if they were lamps) you were depressed enough, but you HAD TO TAKE YOUR SHOES OFF to go in because the FLOOR WAS SO SHINY. Your floors are spotted gum friendly maps of memories - dogs, chairs, tables, kids, shoes, dancing practice, clown bike disasters, juggling, rocking chair dents... Defining feature: Really nice. No flaws. Common Agent features: Dresses slightly better than you, car is better than yours, phone is better than yours. This agent will generally only be recognised by the experienced observer after some practice. 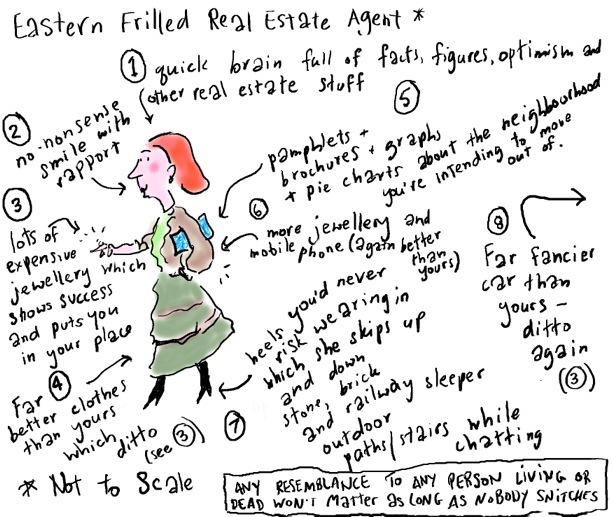 Due to the fact that this agent makes you feel intelligent and important and of higher status than she is, and given that you believe you are intelligent and important and of a goodly height in status, you don’t immediately see that she may not necessarily believe you to be as intelligent, important, and elevated as you do. She outlines her strategy, philosophy and selling plan while constantly glancing up for re-assurance that she hasn’t overstepped any marks, that you don’t mind her going on about all of this, and that she’ll take your advice on any of those points at any time. In fact, You’re the boss. The drawback may be that you don’t want to be the boss, or you would have sold the house yourself. You know very well that you could be an agent (see” Young Double-Breasted WhipperSnapper”) but in fact have elected to pay somebody else to be one, but the allure of status and regard for your intelligence and importance may be deemed worth the fee anyway. Defining features: Tilts head down and looks up at one with humble eyebrows, invites you to be involved at all stages, parks tidily and respectfully without running anything over and in fact re-stakes the baby olive tree (see “Ancient Avuncular”). Common Agent features: Clothing humble and in subdued colours but still better than yours, car better than yours, phone better than yours. Let me point out that I haven’t exhausted the complete range of agents available because the ones I sampled exhausted me first. One question I would advise you to ask any prospective agent is how they intend to react if you tell them you have decided to go with somebody else. This can become a very important factor if you have interviewed lots of agents. It can be a very disturbing evening on the phone and you may need a stiff drink. Or two. Once you have interviewed and classified your various agents it is then possible to make an educated decision which one you feel would best represent your home. Each vendor is different, which is jolly lucky for agents as they all seem to get enough work to buy better clothing, cars and phones than you...which they employ to show how successful they are as agents thus gaining your confidence, and to make you aware of their superiority thus gaining your respect. Or maybe your clothes, car and phone are just crap.